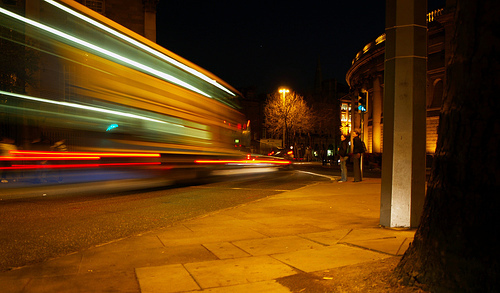 The sights, sounds and smells of late night urban transportation are all powerfully evoked by Nitelink 69N (Westmoreland Street, 2.45am). The dialogue is crisp and authentic, with some riveting individual performances extracted from a cast of veritable unknowns. However, by the time this meandering juggernaut rumbles into Saggart bus terminal ninety minutes later, that potential has, for the most part, largely been squandered. To be sure, the general drunkenness on board does make for some wonderful early slapstick sequences. But the longer this production endures, the more muddled the narrative becomes. Characters arrive and depart at arbitrary intervals, often without warning. In one promising subplot, an exhausted night worker is pelted with soft drinks cans, crumpled up cigarette boxes and assorted rubbish. But just as his irritation looks set to explode into violent rage, his tormentor abruptly exit at Clondalkin Village and the storyline fizzles out. Elsewhere a swarthy middle-aged man attempts to befriends an inebriated teenage girl. But the premise is hackneyed and the interplay unconvincing. Clearly, this bus journey suffers from having far too many characters and not nearly enough character development. As a result, it is unclear whether it is tragedy, drama or gritty social satire. What one is left with then are little more than a series of clumsy, half-formed vignettes. The 69N, ultimately, is a peregrination which crumbles under the weight of its own lofty ambitions. Shows: Thursday – Sunday, 0.00-4.00. I saw the number 4 last week, Ballymun to Blackrock.It was a spectacular rags to riches to rags saga.